Ever wonder how versatile pumpkin puree is? You can make many delicious dishes with it. This time I used it to make a cheesecake. My daughter was so intrigued to know what kind of cheesecake when I moved to my kitchen to get preparation. The two words from my reply, “pumpkin cheesecake” instantly caught her attention. “Pumpkin?” “Exactly. 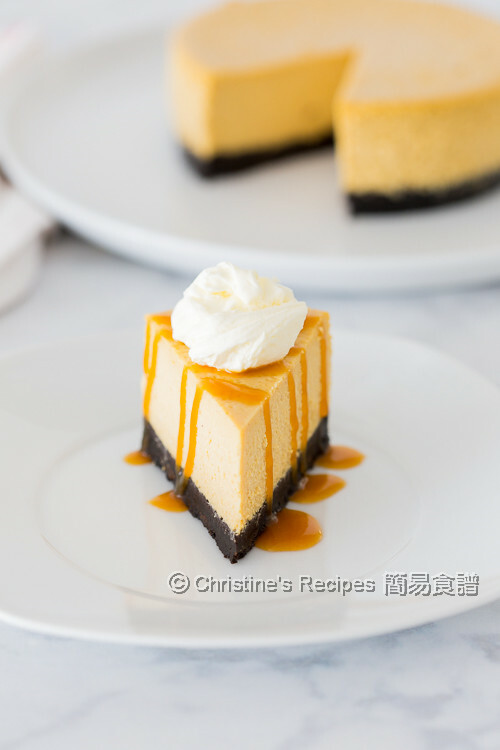 Pumpkin cheesecake.” I felt her curiosity in her tone of voice was doubled to find out what its taste would be like. Well, pumpkin has a natural sweetness in itself. I assured her that making a dessert with this healthy produce will be so right for our taste buds. Once I made this cheesecake and finished taking photos, I shared a large bite with her. Immediately, she returned a feedback that it’s so creamy. I drizzled some caramel sauce on top making this dessert even more attractive. 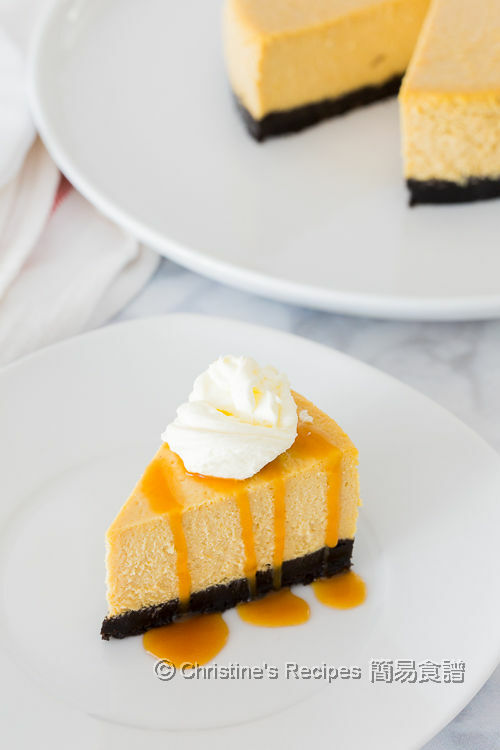 This pumpkin cheesecake is perfect for entertaining your family guests as well. Wrap the cake tin base with a double-layer of foil. 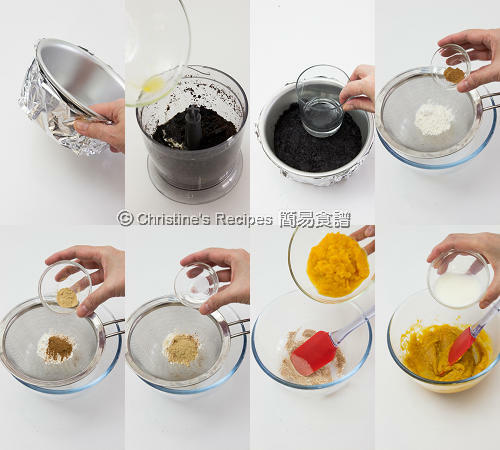 Process the Oreo biscuit in an electric food processor. Add the melted butter. Mix well. Transfer into the cake tin. Lightly press with a spoon or a flat-based cup. Refrigerate for 25 minutes. Sift the flour, cinnamon powder, ginger powder and salt. Combine well. 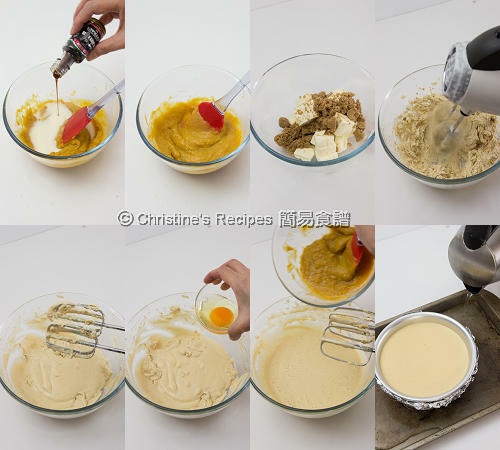 Mix in the pumpkin puree, milk and vanilla extract. Combine well. Dice the cream cheese. Add in the brown sugar. Use an electric mixer to beat the cream cheese until smooth. Add one egg at a time. Beat thoroughly between the addition. Pour the pumpkin mixture into the cream cheese mixture. Combine well. Pour the batter into the chilled cake tin. Place the tin onto a large baking tray. Fill hot water up to ½-inch depth. Bake in the preheated oven for about 1 hour. Remove from the oven and let it cool on a wire rack. Chill in refrigerator for at least 3 hours or overnight. When served, drizzle caramel sauce as much as you like, with whipped cream. Enjoy! I used homemade pumpkin puree. Canned one can be used for convenience instead. Brown sugar can increase a sugar-cane smell. White sugar can be used instead, yet producing lighter colour. Now that's a cheesecake! The texture looks so light and beautiful. Thank you for sharing the recipe. I would like to find out how to scale the recipe to an 8" round tin. Can I just scale up the ingredients by 1 1/3 times? You need to increase all the ingredients by 1.8 times in order to get the same height as mine. Thanks for the recipe! We doubled the recipe with the 8 inch cake tin. Hubby and kids love it. All gone within 8 hours. Wonderful! Glad to know that your family loved this recipe. I noticed this cake doesnt sink in the middle as compare to the blueberry recipe. Any reason? Can i replace the pumpkin with whipping cream if I dont like a the pumpkin taste? It's because of the pumpkin puree. Sorry, you can't just replace the pumpkin puree with whipping cream. It's safe that you find a cheesecake recipe without pumpkin, if you don't like it, and follow it.